Basically a tamarind rice preparation, Pulihora is a popular travel food known for its long shelf life. 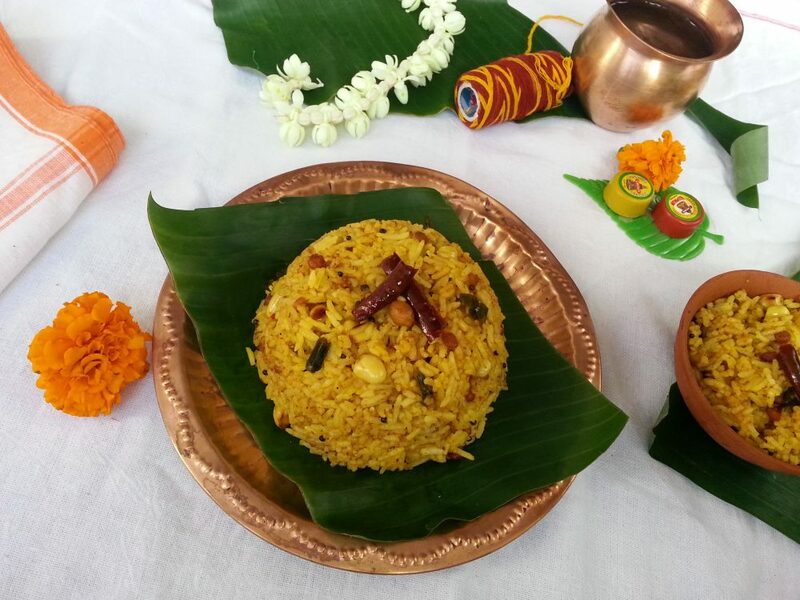 One can also find this rice served as Naivedhyam (Prasad) in most of the South Indian Temples. This classic dish is a perfect blend of tangy and spicy flavors. The roasted lentils and spices used in the spice mix make the rice aromatic and flavorful. Serves as a quick lunch box menu if you have the Puliyodharai spice mix and tamarind sauce ready at hand. Generally served with papadam and vadam. Wash and drain the rice. In a sauce pan heat 2 1/2 cups of water with 1 tsp of oil and salt. To this add the rice and cook the rice in such a way that each grain is separate. Meanwhile we can prepare the spice powder for Puliyodharai. Heat a non stick pan and roast all the ingredients listed under Puliyodharai spice mix separately on a low to medium heat until fragrant. Cool and grind them to a powder in a grinder. Keep aside. Soak a large lemon size tamarind in 1/2 cup of hot water for 10 minutes. Extract the pulp and keep aside until use.Spread the cooked rice on a wide plate to cool down . Add 1 tsp of oil and 1/2 tsp turmeric powder to the rice when still warm and mix well to coat the rice. Take care not to break the rice while doing so. In a non stick wok , heat the remaining oil and add mustard seeds. Once the seeds crackle add the split and skinned black gram and split Bengal gram and stir fry until golden brown. Now add curry leaves, dry red chilies and roasted peanuts. Stir fry for a minute on low flame. Add the remaining 1/2 tsp turmeric powder and tamarind pulp at this stage and cook the mixture until it thickens and oil start floating above the sauce. 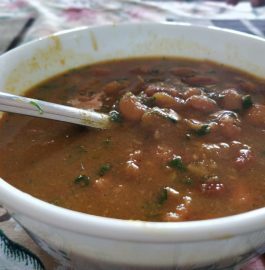 Add 2 tbsp or more Puliyodharai spice powder or as per taste to the tamarind sauce. Stir fry for a while and put off the flame. Reserve some of this thick sauce and add remaining to the cooled rice and mix it evenly using your finger tips. Taste the rice at this stage (if it is not to be offered as prasad) and adjust the salt as per requirement. Add the reserved tamarind spice paste if more of tangy taste or spiciness is desired. Let the rice sit for at least 1-2 hours before serving , so that all the flavors get incorporated well with the rice. Serve the delicious Puliyodharai with papadam and enjoy with your loved ones.